We're your partner in the Green Movement in Florida and across the U.S.A.
worm-created fertilizer in a courteous manner. We're always available to provide you information or answer questions about using our worm castings fertilizers. 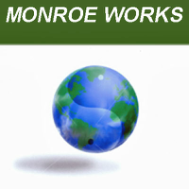 Monroe Works is located in Archer, Florida. We supply the backyard gardener growing roses to the chia farmer on hundreds of acres. You receive the same personal care and attention regardless the size of your plot. If you have any questions about our business, service or our organic fertilizers made from pure earthworm castings, feel free to contact us. Request a quote on bulk quantities or shop at our secure online store.